Vitamins & MineralsScitec Monster Pak - 60 sasz. Scitec Monster Pak - 60 sasz. MONSTER PAK is our top product, which provides vitamins and minerals based training PAK, along with extra additives. Vitamins and minerals are the basic and essential nutrients that can not miss in the diet of the athlete. 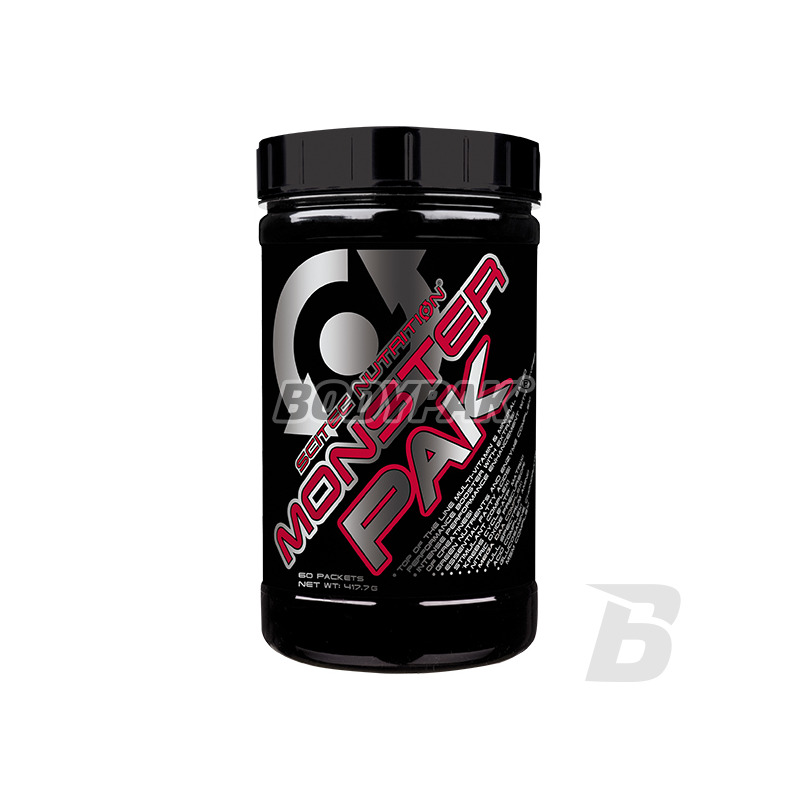 MONSTER PAK, offers a min. high doses of vitamin B complex and vitamin C (rosehip), and essential minerals, including zinc and selenium. Vitamin C contributes to the proper functioning of the immune system and the nervous system and reduce tiredness and fatigue. It also helps maintain normal immune function, during and after intensive training (favorable results are obtained with a daily intake of 200 mg, in addition to the recommended daily dose of vitamin C!). Vitamin D, in turn, contributes to the maintenance of adequate muscle function and the immune system, and to absorb calcium and phosphorus. Zinc contributes to normal fertility and reproduction, to maintain a normal level of testosterone and to the corresponding macro-metabolism. Magnesium contributes to the normal functioning of the nervous system: neurotransmission and contraction of muscles, including the heart muscle, also it contributes to the relevant protein synthesis, and to maintain healthy bones and teeth. * Selenium is responsible for the proper activity of sperm and thyroid function, also helps to maintain healthy nails and hair. MONSTER PAK provides "green" herbal blend with digestive enzymes. Complete whey protein responsible for the source of the essential amino acids including BCAA. The product contains nitric oxide (NO) which is the precursor of L-arginine. MONSTER PAK would not be complete without energizing ingredients as various forms of L-carnitine and creatine, glucosamine, chondroitin, MSM and a complex of D-aspartic! 2 sachets a day, one of each kind. Packaging: 30 + 30 s.
Bardzo kompleksowy skład, a działanie oceniam bardzo pozytywnie! Trochę przeraża cena, ale warto się skusić, bo regeneracja poprawiła się zdecydowanie ! Electroactive is a dietary supplement containing five major electrolytes: sodium, potassium, chloride, calcium and magnesium. Preparation are based on the correct dose of calcium and vitamin D. With it you will be able to take care of the health of your bones and the next you people! Do not wait and reach for your health! Olimp Potas - 60 kaps. Dietary supplement containing potassium citrate, which is a highly digestible source of potassium - essential mineral in all organisms. UNS Zinc - 90 kaps. Nutrend Salt Caps - 120 kaps. Precisely balanced nutritional complex, which is a perfect supplement to the diets of all professional athletes and persons burdened with significant physical and mental health.